Colin Kaepernick Won, by Josh Levin (a Jew) on slate dot com, Aug. 18, 2017: [In angering the NFL’s white billionaire owners, the quarterback lost his job but started a movement. ]; [On March 17, Colin Kaepernick celebrated the success of a joint effort to prod Turkish Airlines to fly 60 tons of food and aid to people in Somalia. 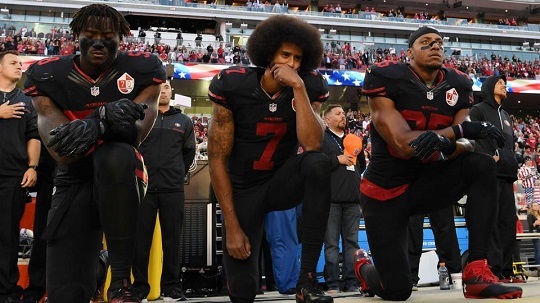 ]; [league decision-makers “genuinely hate” the anthem-protesting quarterback]; [they don’t want to get a nasty tweet from Donald Trump.”]; [A poll conducted last fall by Quinnipiac University found that 63 percent of white Americans disapproved of anthem demonstrations while 74 percent of black Americans approved]; [The NFL is a white-run league]. NFL Still Shunning Colin Kaepernick Because of His Politics, Not His Play, by Mike Freeman, on Bleacher Report dot com, on May 12, 2017: [Left-leaning NFL fans (and non-fans) see Kaepernick as being shunned by the NFL for taking a knee during the anthem]; [Bleacher Report Writer Applauds NFL Detour into LGBT Interests]. Bleacher Report, owned by Turner Broadcasting System, The Company’s assets include CNN, HLN, TBS, TNT, Turner Classic Movies, Cartoon Network, Adult Swim, Boomerang and TruTV., [LeBron James Calls Donald Trump the ‘So-Called President,’ Talks Charlottesville]; [Kobe Bryant Criticizes Donald Trump on Twitter]; [LeBron James: Donald Trump Has Made Hate ‘Fashionable Again’]; [Kevin Durant: ‘We Don’t F–k’ with Donald Trump After LeBron James Criticism]; [Steve Nash Rips Donald Trump for Defending White Supremacists, Promoting Wine]; [David Fizdale Calls for Memphis Confederate Statues’ Removal, Rips Donald Trump]. Mike Freeman (columnist): In January 2004, Freeman resigned before starting a columnist job at The Indianapolis Star after he was discovered lying about his education, specifically falsely claiming a college degree. I am sure from the above information and more that the African American community fell into the hands of Jews; and now Blacks are fighting the Jewish globalist war against the USA. This is very troubling and self-destructing. I wish people reconsider their stand on the matter and play positive role in protecting the USA by bringing the communities together for their common national interests.